Though not the biggest fan of the Coen Brothers, I can definitely appreciate their distinct voice and commitment to filmmaking. I personally wouldn’t put any of their works in my top favourites of all time, but I had a good time making my way through classics like Fargo, The Big Lebowski, and Burn After Reading. Their recent Netflix outing, a bizarre Western anthology film named for the protagonist of its first vignette, The Ballad of Buster Scruggs produced in me almost an opposite reaction. I felt that it dragged at points and wasn’t always charmed by what I was watching, but it presented such memorable images and unavoidably affecting concepts that I feel a strong attachment to it. To reveal the premise for each segment would be to spoil them in my eyes, so I’ll explain the framing device instead. The film opens on an antiquated book, which features the six stories and illustrations that introduce them, and returns to it at the end of each chapter. This helps to place the stories in a familiar context and reaffirm their connectedness at the times when the film is at its most disjointed and cryptic. Viewing them as old folk tales brought to life certainly helps bring them together with a central theme – everybody dies. Rather than continuing onwards after a lead character in a segment dies, the film moves onto its next subjects, and never brings up the deceased again. There is no grand reunion or twist that reveals hidden connections, or later scenes that revisit the same (usually brilliant) cast of remaining characters. The only blatant connection is the mortality that these characters share, whether their demise is self-inflicted, accidental, or entirely inevitable. The choice to make this film a Western therefore feels increasingly apt; the Coens use a dead genre as the arena for characters that aren’t going to make it out alive. 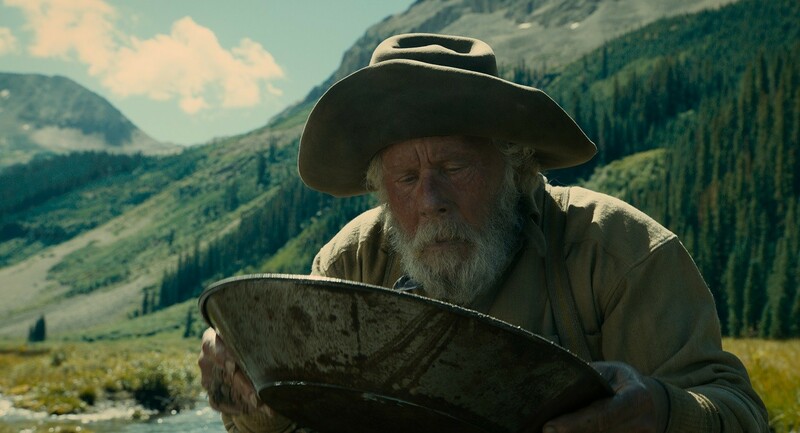 Going into The Ballad of Buster Scruggs, I was convinced that the title character would be a guiding hand throughout each tale, perhaps a narrator, and I was endlessly charmed by Tim Blake Nelson’s goofy deadliness as he takes down entire taverns with a joke but no sweat. This made the slow tonal shift far more intriguing to me, as after (spoiler alert) Buster dies at the end of his brief tale, the shorts become less and less farcical, ending in what can possibly be described as a Gothic ghost story that happens to use the Old West as a backdrop. The visuals change to match – though appealing throughout, they begin with shaky CGI and Tarantino-esque violence, before shifting into a more gritty realism, and eventually into fantastical territory. Also, Tom Waits is fantastic, and that was basically enough for me.